The great strength of the arbitration process lies in its independence from any particular legal culture. Inevitably, its cross-cultural perspective has brought it to the fore as the preferred means of resolving international commercial disputes. The Institute of Advanced Legal Studies in London has done more than any other group to promote and sustain the development of international arbitration and to define the law and practice that has grown up around it. In a series of remarkable public lectures held during its jubilee year, the Institute reasserted its preeminent and creative role in the field of alternative dispute resolution at the international level. These lectures form the basis of the insightful papers assembled in this book. The nine authors bring a truly international perspective to their work. Their combined experience has involved them in arbitration in many countries in Europe, Asia, North America and South America; several of them have in addition had various posts in international diplomacy and in major international organisations. They include Dr Christian Borris, on the civil law versus common law in arbitration culture; Professor Andreas F. Lowenfeld, on the `mix' that creates the international arbitration process; Dr Serge Lazareff, on the search for a common procedural approach; Sigvard Jarvin, who compares the leading international arbitration seats; Jonathon Crook, on arbitration seats in the Far East; Ambassador Malcolm R. Wilkey, on the practicalities of cross-cultural arbitration; Jean Reed Haynes, on the confidentiality of international arbitration; Dr Horacio A. Grigera Naón, on Latin American arbitration Culture; and Dr Bernardo M. Cremades, on how interactive arbitration overcomes the clash of legal cultures. 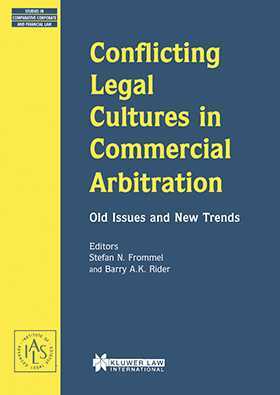 Conflicting Legal Cultures in Commercial Arbitration brings international arbitration as it is currently practised into sharp focus, and will be of great value to all practitioners, academics and students in the field.